Comments: A Link to the Past is one of the Super Nintendo’s greatest titles. Largely unchanged, it remains a classic of gaming on the GBA. What happens when one of the best games of the 16-bit era gets ported to Nintendo's Gameboy Advance? It remains one of the best games of the 16-bit era! Few games are able to transcend their period, but The Legend Of Zelda: A Link to the Past remains one of the most engrossing games ever to grace the Super Nintendo (and now the Gameboy Advance). Other than the inclusion of Four Swords, the GBA's version of Link to the Past remains faithful to the SNES original. The controls feel a little wonky, as the GBA only has two standard buttons and two shoulder buttons (opposed to the Super Nintendo's four buttons plus two shoulder buttons), but one can easily get used to them and it shouldn't be a problem for anyone but those of us who got acquainted with the game back in the 16-bit days. Link to the Past features the same action-RPG style game play that graced the Nintendo games (except Zelda 2) before it, and the Gameboy Games (like the Oracle series and Link's Awakening) afterwards. The colors in Link to the Past are bright and vivid, especially for the GBA. The game competes well with its latest contemporaries, Mario Advance 3 and Kirby's Nightmare in Dreamland in the graphics department. All three represent the best the GBA has so far offered, as far as visuals are concerned (which is unsurprising, since Zelda and Mario Advance 3 were some of the biggest titles on the Super Nintendo). The sound echoes the SNES's reasonably well, though it sounds a little tinny on the GBA. The game play is the same puzzle solving adventure seen in previous Zelda titles. Link will battle a number of baddies in real time, using a sword or other items he gains in his travels. He will also have to navigate through treacherous dungeons, solving puzzles to make his way through Hyrule. This is all to save the Princess Zelda (which actually happens early on) and defeat Gannon. 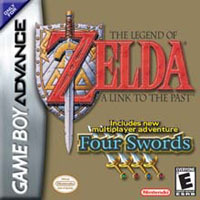 This version of Link to the Past also contains a new multiplayer play mode called Four Swords. In this mode (Link looks like the blonde Link in the upcoming Gamecube Zelda title The Wind Waker, not the Link in Link to the Past) up to four friends solve puzzles and gain items. To make it through Four Swords, one needs at least one other player. Two total Links are needed, but up to four can play at once. The items gained in Four Swords can be transferred over to Link to the Past, slightly changing the game play dynamics of the latter, when compared to the SNES original. There are very few complaints to be made about Link to the Past. The ease with which it can be finished is one of them. However, while it is easy to reach the end of the game, hunting secrets like heart containers, bombs and the like will have gamers playing on for quite some time. Additionally, despite the timelessness of Link to the Past the fact remains that this game has already been released once. While younger gamers who met Link through Oracles, Ocarina of Time, Majora's Mask, or even Smash Bros Melee will benefit from this revisit to one of Link's greatest adventures, many of us have been there already. The Legend of Zelda: A Link to the Past is one of those perfect car games. Engrossing, colorful, fun, and addictive, Link's grand adventure can take the monotony out of road trips. Link to the Past, a hallmark of Shigeru Miyamoto's talents as a game designer, was lovingly crafted as one of the Super Nintendo's marquee titles, and that attention to detail is evident in this version as well. This is one of those titles that no one should be without. Everyone, even those of us who have the original Link to the Past for the Super Nintendo, will enjoy Link's new portability.